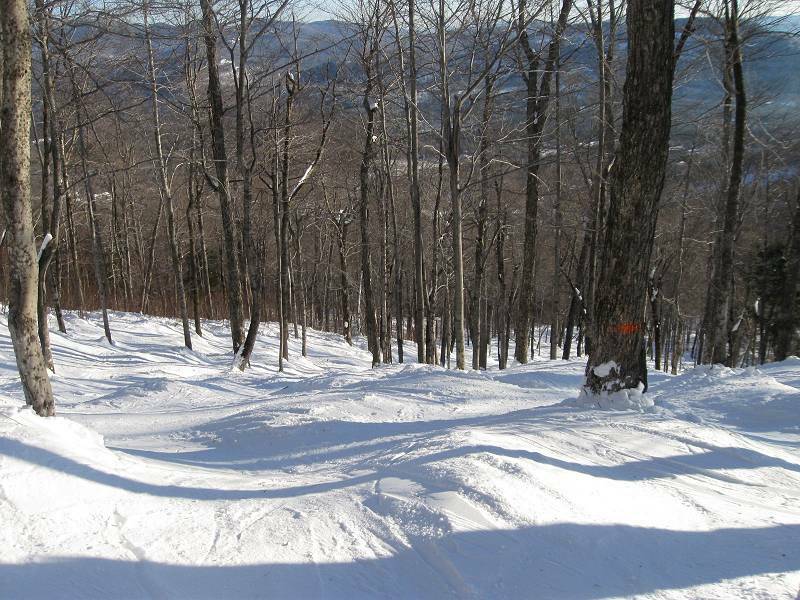 Sunday River is one of Maine's largest ski resorts located just outside of Bethel in Newry, Maine. The mountain is a set of 8 interconnected peaks spanning 3 miles offering terrain for all abilities. This is certainly a ski resort, with many on and off mountain lodging and dining options. They do offer night skiing center mountain on select weekends. This review, as all mountain reviews, will focus on the family weekend day-tripper. There are three lodges at Sunday River. White Cap at the eastern end of the resort with the Barker and South Ridge lodges situated in the center. If you need rental or ski-school services, you will need to head to South Ridge. Barker is a smaller lodge but tends to be a little less busy than South Ridge. White Cap is the quietest lodge of the bunch, but situated at the far eastern end of the resort. So it makes it a longer effort to access the mid-mountain an western mountain terrain. The lodges are fairly plain buildings with kind of an industrial feel, but they serve the purpose of moving people around and getting out of the cold. Parking varies by Lodge. Parking at White Cap is good with a level walk to the lodge for the gear schlep. Barker parking tends to fill up quickly and it is an uphill grind to the lodge. While South Ridge offers the most parking, but it can be quite a distance to the lodge as well. All three lodges are services by an on-mountain trolley. I give a grade of a B- for parking access and a B for the day lodge. We have only visited Sunday River on weekends - so we got to experience the Sunday River crowds. Sunday River by far is the busiest resort in Maine. To escape the crowds a bit, you need to get out of the center mountain area. Go far west, towards the Jordan Bowl or go Far East, towards White Heat area to get a little more room to ski. On busy days, the center mountain is a spaghetti network of trails and your head has to be on a swivel to make sure you don't run into somebody or get run over yourself. Sunday River has an impressive lift system. There are lots of high-speed quad lifts and even an enclosed Chondola that services the South Ridge area. The White Heat area has slower fixed grip lifts. Lines can sometimes be long but there are a lot of lifts to choose from. My favorite lift center mountain is the North Peak Express. It services some good terrain and is typically not quite so busy. Sunday River certainly has a lift system designed to move a lot of people quickly. I give a grade of an C- for trail crowding and a A for lift infrastructure. Center Mountain by the South Ridge lodge is where most of the beginner terrain is. Mid-week with less crowds I am sure this terrain would be perfect. However on a typical weekend day it might be too close for comfort for a new skier. Advanced beginner skiers should hop on the North Peak chair and take Dreammaker, one of the best green trails I have skied in Maine. Nice and wide with a good pitch that allows the beginner to take the next step up in their skiing. Head far west to Jordan Bowl and take a few runs on Lallapalooza, another great green trail. One other hint: The white cap lodge mostly serves advanced terrain. However, there is a lift from this lodge that services a nice beginner section with a variety of trails to choose from. This is a good option for beginner families that don't need ski-school or rental services. I give a grade of an B to the beginner terrain. 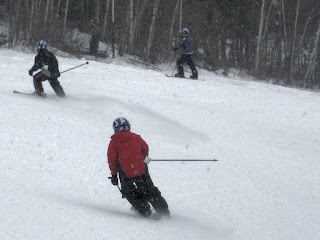 Sunday River has some great intermediate cruisers off all its peaks. The same holds true, the farther away from the center mountain, the less crowds you will have to contend with. My favorite intermediate trail is more of a winding fun run called Lazy River. Lots of turns and humps to keep things interesting. One note about Sunday River trails. You ski right to the lift. There is very little flat run-out at the bottom of the mountain which is good. I give a grade of a B+ to the intermediate terrain. Terrain Park hounds have a lot of options at Sunday River. There are numerous parks on the mountain offering big hits to more beginner style parks. I have to say its a bit of a clique in the parks - you need to be wearing the right gear and say the right things. But Sunday River offers some good park options. I give a grade of a A- to the terrain park. The White Heat peak probably gives the steepest terrain on the mountain with each peak offering black cruisers. There are a smattering of natural, bumped trails but Sunday River pretty much mows its terrain flat with its big fleet of groomers. I find the expert terrain gets icy quickly due to all the traffic. Ski em early! But the expert groomer-only skier should be happy here. I give a grade of an B to the expert terrain. 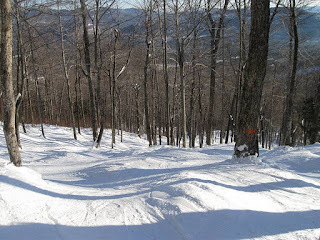 Sunday River has a surprising number of glades and the boys and I have had a lot of fun in them. Due to the traffic, they get skied out pretty quickly but they are well cut and you can find glades on my parts of the Mountain. Jordan Bowl expanded its glade by quite a bit and I am anxious to check it out. I give a grade of an B to the gladed terrain. Sunday river has a very good snowmaking system and they open very early every year. However, they have to pay for this infrastructure so it is expensive. Check the resort website for the latest pricing. I definitely used my Winterkids passes here when my kids were in 5th-7th grade. I give a grade of an C for day-trip lift ticket pricing. Since it is a resort bundling tickets with lodging certainly makes more sense of those with a multi-day resort trip in mind. Sunday River is a good Maine mountain. I would really like to visit on a non-holiday mid-week as with less crowds. I bet it would be a blast. Honestly, it is a bit of a fashion show on the slopes. I have seen my one and only fight on a ski slope between a teen snowboarder and an adult at Sunday River. Unfortunately, that kind of tension is in the air a bit when skiing Sunday River. Lots of folks are friendly, but there is lots of folks in kind of a bad mood. That being said, the mountain terrain is good, the snowmaking is very good and the lift infrastructure is superior. There are a lot of people that love Sunday River. It is easy to get to and offers a lot of on and off mountain amenities. However, once our family gets past early season, there are just other mountains in Maine we would rather ski. Look for more ski mountain reviews in upcoming posts. Feel free to comment on what you think about Sunday River below. actually even week ends you can escape the crowds by sticking/hiding to for example oz peak. When the snow is right the trail ruby palace there is a blast. In terms of terrain it has a great variety and it is very and enjoyably different from many classic big mountains like sugarloaf because of it bowl type of architecture. Actually I like all three of them sunday, sugarloaf and saddleback. I am definitively going to add abrams to my list. I have skied shawnee only once. I definitely agree with the ranking having skied all of Maine's larger mountains except for Big Rock and Sugarloaf. I would much rather visit Mt. Abram than Sunday River (I've been to both multiple times) and I think you're ratings are very accurate!